LiveCode LessonsLiveCode LessonsHow to - LiveCode Marketplace Products Data Grid HelperHow Do I Create a Checkbox in a Column? This Lesson presents how to create a column containing a checkbox button in a data grid, using the Data Grid Helper Plugin. Name the last column "Checkbox". 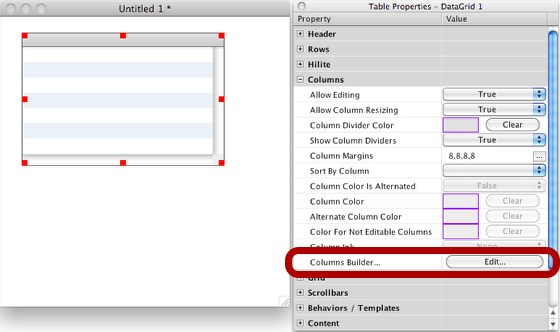 Double clicking on the Checkbox Button in the Column Content, will open the Properties Inspector. 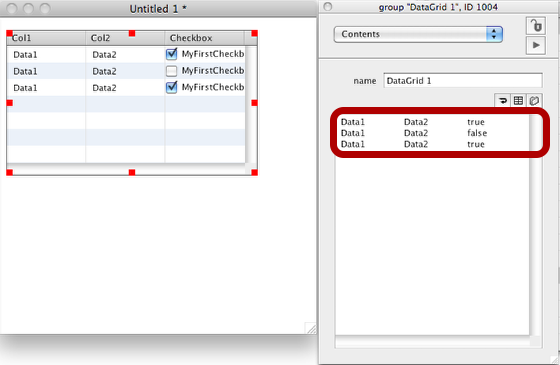 DGH can now build the required script for managing this check box according to the column data. After the script is built update the DataGrid Preview, by clicking the "Update" button. Note: The Checkbox will be checked when the checkbox column value is true, and unchecked when false. Congratulations! You have developed your first custom column in a DataGrid, without entering any script. Prev: How Do I Change the Number Format of a Column by Script? Next: How Do I Give Color To a Non Editable Column?